How rare it is these days for a movie to cause an audience to spontaneously break into applause at its end. Prosecuting Evil is such a film. And though clearly out of sync with the rest of the pablum on the cineplex marquis (Ralph Breaks the Internet,?The Grinch,?Instant Family), this truly extraordinary story of a tireless crusader for peace delivers a most relevant message for the season and our time.? 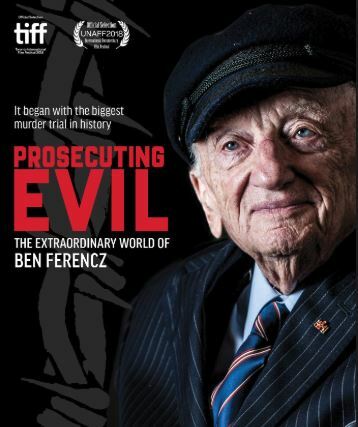 Fresh from its premiere at the Toronto International Film Festival, it is a fascinating portrait of Ben Ferencz, the last surviving Nuremberg Trial prosecutor. ?A relentless gadfly and key agitator for the creation of the UN’s International Court of Justice in The Hague, the now 98-year-old lawyer continues his fight for law and peace. With the current resurgence of racism, antisemitism, and the alt-right, and the weakening of long-standing international alliances predicated on common values and notions of justice, his message is indeed timely.